As mentioned here last month, On Saturday afternoon, 7 July, H.H. 17th Karmapa Trinley Thaye Dorje and his entourage from the East and West, including representatives of of Diamond Way Buddhism UK and Dechen, participated in an important interfaith event. They were received in BAPS Shri Swaminarayan Mandir, Europe’s first traditional Hindu temple, located in Neasden, north London. 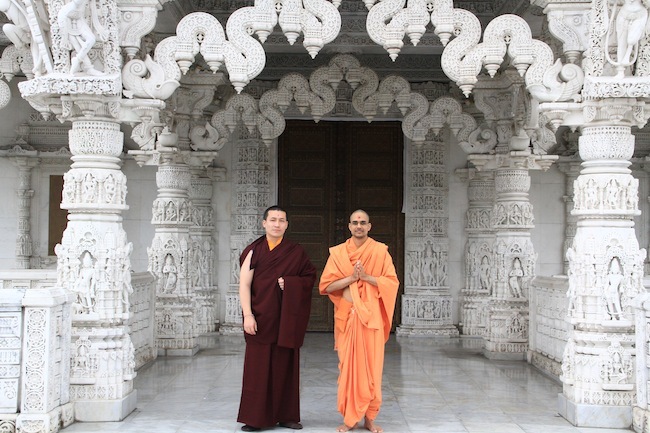 It is dedicated to Bhagwan Swaminarayan, whose fifth spiritual successor, H.H. Pramukh Swami Maharaj, is also the Mandir’s creator.